“What we like to see is the horse and rider connecting… that’s our biggest joy. We are in this to help take the fear out of riding and put passion in its place. After that, we want to educate students and teach them to understand the horse beneath them.” This is the mission statement that Steve and Kathleen Leatherman strive to run their program by. Steve and Kathleen combined have years of experience being around horses. We are excited to be at our new location in Herald, CA. Our ranch is a work in progress as it was not horse property when we purchased it. Many changes have taken place here at the ranch already this year as we have been getting set up and ready to begin our Horsemanship and Riding Instruction program. We look forward to what our future holds and hope to be part of your life experience with horses and all that can be learned from being on and around them. We provide Western Riding Instruction with a Natural Horsemanship approach. We teach the importance of the connection between horse and rider. Understanding how the horse thinks will give you the ability to form a partnership with any horse. 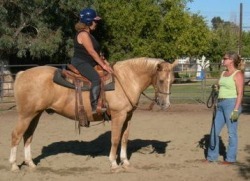 Our program includes the basics in ground work, horse handling, safety, and riding instruction. Our Riding Instruction includes: proper care and feeding, basic health care, hoof care, grooming, tack and saddling, etc. We teach our riders the basic care of the horse along with handling from the ground...to the saddle and it is all included with our riding instruction. Many of our riders do or would like to own their own horse someday and we want to prepare them to reach that goal. We are experienced, fully insured and we’re affordable. We provide a fun, friendly learning environment that will add to your riding experience. We're excited that our business continues to grow. We'd like to thank our students who allow us the opportunity to do what we love to do. Please join us as we continue to provide excellence in horsemanship. Please learn more about us and our horses by exploring our Web site. If you'd like to schedule lessons or ask questions, please call or email us!